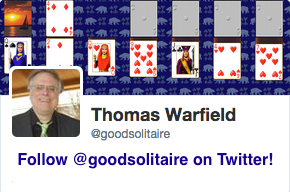 The first big Goodsol event of 2016 will be version 16 of Pretty Good Solitaire for Windows. Version 16 wil have 20 new games for a total of 900 games. That will actually be the largest number of new games in a single new version of Pretty Good Solitaire for Windows since 2007. But even though the new games alone make this the biggest new release in nearly a decade, there is much more. There will be two new larger card sizes in version 16 for very large resolution screens. In addition, many of the game screens, especially the game winning screen and the statistics screen, have been made larger. The entire Favorites system was redone, so that in version 16 you can delete a game from Favorites from inside the game as well as add it. And there are many more little changes. Version 16.0 is the first version of Pretty Good Solitaire developed in Windows 10, so many of the changes are designed to make the game look better or run better on Windows 10. But for those few of you still on Windows XP, don't worry, the game will still work on Windows XP (and Vista, 8, 8.1, and of course the still very popular Windows 7). Going forward it is clear that Windows 10 is the future and building out new versions of our games for Windows 10 will be our focus in 2016. There will still be updates to the Mac and iPad versions (in fact one is in the works). 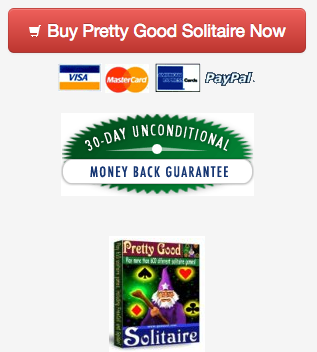 Look for the new version 16.0 of Pretty Good Solitaire for Windows in early February! For more details, see http://blog.goodsol.com/2016/01/coming-in-2016.html . I have an update on how our cats are doing, complete with pictures, on the blog at http://blog.goodsol.com/2016/01/update-on-our-cats.html . Pretty Good MahJongg (both Windows and Mac versions) are on sale to newsletter subscribers until January 26th. Get Pretty Good MahJongg for $17.95, $7 off the regular price of $24.95. Pretty Good MahJongg is a collection of solitaire games with MahJongg tiles, including the classic MahJongg solitaire tile matching games, and original games such as MahJongg Klondike, MahJongg FreeCell, and more. To get the discount, simply download the trial version from http://www.goodsol.com/pgmj . Then sometime before January 26th, click on one of the order links in the trial version (such as when you start the game or exit from the game). The trial version will automatically take you to the order with the $7 discount. Works on Windows 10 (and Windows XP/Vista/7/8/8.1) and on OS X (Snow Leopard, Lion/Mountain Lion, Mavericks, Yosemite, El Capitan). Our new online games site at http://www.goodsol.com/play now has 103 games! The new games so far this year are Ace of Hearts, Anubis, and Backbone. This game is at Sixes and Sevens.